Nissan's engineers have been inspired by the animal kingdom as they develop new technologies that will shape the future of mobility. One of Nissan's longer term R&D goals is to achieve virtually zero fatalities and serious injuries among occupants of its vehicles. the behavior of animals moving in groups helps engineers understand how vehicles can interact with each other for a safer and more efficient driving environment," said Toru Futami, Engineering Director of Advanced Technology and Research. "In our ongoing quest to develop collision-avoidance systems for the next generation of automobiles, we needed to look no further than to Mother Nature to find the ultimate form of collision-avoidance systems in action, in particular, the behavioral patterns of fish." The research team created the Eporo (Episode 0 Robot), utilizing Laser Range Finder (LRF) technology-inspired by the bumblebee's compound eyes that can see more than 300-degrees along with other advanced technologies. Six Eporo units communicate among themselves to monitor each other's positions to avoid collisions as well as be able to travel side-by-side or in single-file, thus exhibiting the behavior of fish swimming in schools. "In current traffic laws, cars are supposed to drive within the lanes and come to a halt at stop signals, but if all cars were autonomous, the need for lanes and even signals could be gone. We talked about fishes earlier, and fish follow these three rules: Don't go away too far, don't get too close and don't hit each other. Fish form schools with these three rules. A school of fish doesn't have lines to help guide the fishes, but they manage to swim extremely close to each other. So if cars can perform the same type of thing within a group and move accordingly, we should be able to have more cars operate with the same width roads. This would lead to more cars, but with less traffic congestion," Futami explained. "Eporo can also communicate with one another at intersections, deciding which would go and which would stop, thus eliminating the need for traffic signals." Prior to the development of Eporo, Nissan created the Biometric Car Robot Drive, or BR23C, which mimics the uncanny collision-avoidance ability of bumblebees. It was a joint project with the Research Center for Advanced Science and Technology at Japan's renowned University of Tokyo. Inspired by the bee's compound eyes that can see more than 300-degrees, the Laser Range Finder (LRF) detects obstacles in a 180-degree radius in front of it up to two meters away. The BR23C calculates the distance to the obstacle(s), then immediately sends a signal to a microprocessor, which translates this information and moves or repositions the vehicle accordingly to avoid a collision. 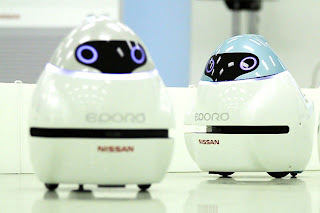 "The split-second it detects an obstacle," explained Toshiyuki Andou, Manager of Nissan's Mobility Laboratory and Principal Engineer of the project. "The car robot will mimic the movements of a bee and instantly change direction by turning its wheels at right angles or greater to avoid a collision."